Top stitching thread is heavier weight than traditional thread; I use Gutterman buttonhole twist or Upholstery thread. You put this thread in the top of your machine and use regular sewing thread in the bobbin. 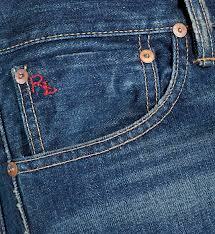 90/14 is a special needle sized for top stitching; it has a larger eye to accommodate the thicker thread. Your stitch line should be slightly longer than a joining stitch when you’re topstitching. Sometimes your project might work better with a different thread & needle for topstitching; choose your machine needle wisely. Consider a fun contrasting color – this can bring a interest and creativity to your finished project. Take your time and test on a piece of scrap fabric first. Make sure you use the same number of layers in your test swatch as you’ll have in the finished project, and test out a few different threads, needles, and stitch types/lengths before you decide on the final technique. Topstitching on knits is very tricky. It is important to not have puckered or wrinkled seams. One way to avoid that is to use a twin needle for topstitching knits. Adjustable Blind Hem Foot is good for this. you can adjust the edge to the right setting for the spacing you require. Depending on the thickness of fabric layers, the tension may need adjusting. This is especially important with denim/jeans. Again, it’s always important to do a test piece first. If you’re using a thicker fabric or a lot of layers, position some scrap fabric under the back of your presser foot before you begin to sew. 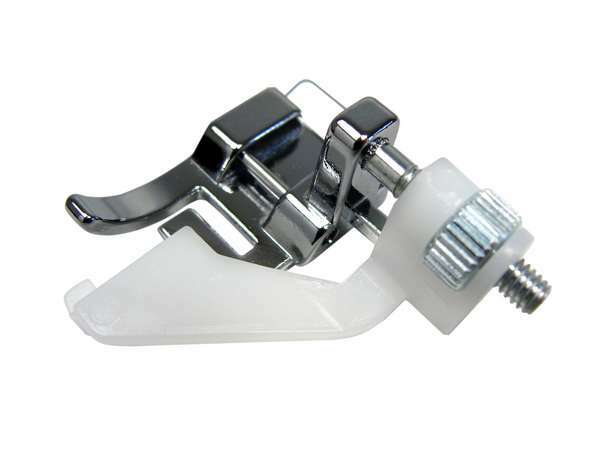 This allows the presser foot to remain straight, horizontally, so that it does not have to “climb uphill” to begin sewing the garment. Do not backstitch – at least, not in the traditional way. Instead of stitching back and forth a few times to begin and end your topstitching, first shorten your stitch length to something very short; backstitch just once back and forth, then lengthen your stitches and sew as normal. This creates a more subtle way to anchor your stitches. Try on any garment before you start the topstitching. It’s much harder to unpick topstitching than it is to remove traditional seams. Whenever possible, save all of your topstitching until the end of a project. That way you only have to change out your thread, needle, and stitch settings one time instead of going back and forth from traditional stitching to topstitching. Stabilize fabrics as needed. Use spray starch to stabilize stretchy or thin fabrics before you sew. Another option is to add a layer of interfacing between the fabric layers, or to use tear-away stabilizer under the material and then tear it off when you have finished sewing. Add cording for extra impact. If you really want your top stitching to stand out, position a length of embroidery cotton where you want the stitches to go, and then stitch over the cording with a narrow zigzag to hold it in place. Step outside of the box and experiment with your decorative stitches! When you have finished sewing, pull the top threads to the bottom or back of the work and tie them in a knot with the lower threads, then trim. ← Dior and I movie is a must see!